We didn't really get to much schooling today, but my kids did learn some life skills. Since I don't work my husband works that much more and this week he's gone away on business. While there are many huge downsides to him being gone one of the upsides is that I've become much more self- reliant. He only left this morning and already I've cleaned a good portion of the house, fixed the toilet so it now flushes (I only had to replace the flapper), & caulked the bathtub so the water will finally stop leaking between the tub and tile; all of which I had the boys either help me with or watch so they can learn how to do it too. While Ian and Alec were off to LEGO camp again today, I prepped Ian's room for painting. All of my boys wanted their rooms redecorated this year for their birthday gifts and I'd never gotten around to getting Ian's room done. He has some huge pieces of furniture I've been waiting on my husband to move but I decided today that Ian has been waiting patiently long enough. I had Evan help me remove everything from the walls and pile it on the beds. Then we pulled the furniture into the middle of the room and started taping off the trim and outlets so it would be ready to paint after lunch. We never got around to painting though because I had no idea it was Otter's birthday today! My 4 year old decided that today was his stuffed otter's birthday and since Otter was turning 5 it was a very important day. 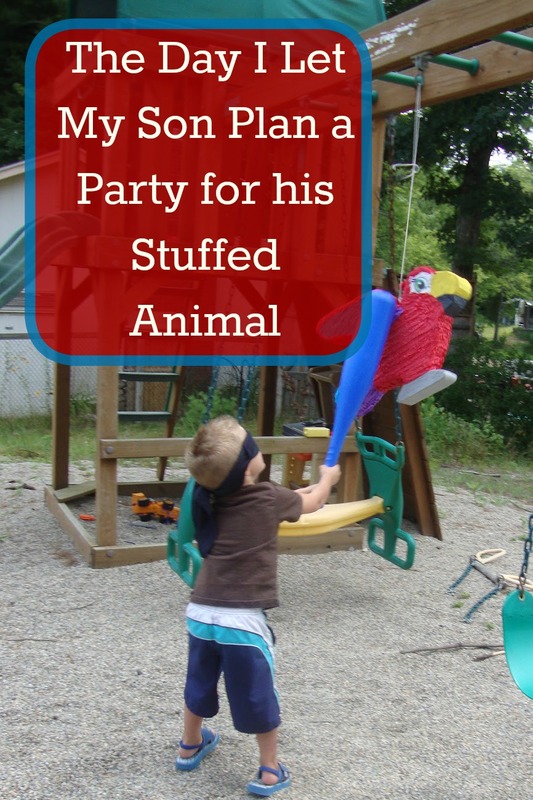 Evan planned a party for him complete with pinata! (Yes, I just happened to have one handy- weird I know). Evan decided that after LEGO camp and lunch we' d go outside and break the pinata, then play a new game (and I quote Evan on this) "I made up this neat new game called hide and seek where you have to hide very fast! ", then he wanted everyone to come inside and dance in the dark in his bedroom with the lights out and the curtains shut. It sounded like fun and it was very cute to watch Evan take over in our house for a day and plan the party. During the car ride home from LEGO camp Evan was telling his brothers all about the part he planned and I was happy to realize that the Pinata left us open to a whole discussion on Mexico and Mexican customs. I reminded my boys of our trip to Disney and the Mexican pavilion at EPCOT. They were able to think of the dresses, Mexican hats and hat dance, tacos, quesadillas, and a few Spanish words-- all in just a quick 10 min. discussion in the car! By the time we got home they had a bunch of questions so I looked up Mexican clothing, Mexican food, and Mexican crops and found articles relating to them all. We read all the articles and looked at all the pictures. I just love having a computer so we can learn at the drop of a hat when they're interested in something. By the time I finished reading about Mexico, lunch was over and the boys couldn't wait one more minute to start the party. We all had a great time at Otter's party and Evan says Otter loved his party too, but the party had to end so Ian could make it to his piano lesson on time and then the two younger boys had physicals with their Dr.